The Caldicot and District Historical and Archaeological Society which has 70 members and twelve active volunteers have an interest in the Severn railway tunnel that was built at the end of the 19th Century. In 2011 the Society was offered a room at a social club in Sudbrook, the village that was built to house the workers for the tunnel, which the group renovated and converted into a local historical centre, staffed during the summer season by volunteers. The Society approached adventa for RDP funding to improve the visitor experience as well as make the management of the centre more efficient with less dependence upon volunteer presence, so that the centre could be open every day, to attract walkers on the Wales Coast path that passes the building. 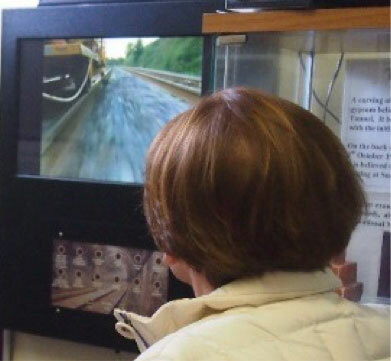 RDP funding was used to install CCTV; refurbish the toilets and make them accessible to walkers; a feasibility study was completed for the Tunnel Centre, they had previously received funding from the Community Pride Grant in 2011 to install display boards, a table and a DVD player which showed a film about the Severn Railway Tunnel but they were keen to build on this. An interpretation plan drawn up and further video footage and images were acquired and edited and displayed using a touch screen display kiosk. Signage was also provided. A local artist and railway enthusiast painted murals on four internal walls of the building. The Non-Political Club is the main retailer within the Sudbrook area. The Club itself has experienced an increase in sales. More groups/members are using the space for meetings whilst some visitors to the centre are spending longer in the building and are spending money in the Club’s bar. Visitors to the Subrook and the immediate surrounding area are benefitting from an improved visitor experience. The Centre mainly appeals to railway enthusiasts, walkers, local school groups, and organised groups. People can either visit the centre on their own viewing the artefacts unaccompanied or organised visits can be arranged. For those visiting the Centre as a walker, the building provides a welcome rest point with access to toilets and hot and cold beverages. An unexpected impact of the project has been the increase in the numbers of people donating historical artefacts for the Centre. Overall Peter and the Society were pleased with the support provided by Adventa, reporting there to have been “a sense of genuine enthusiasm” from the staff. The whole process from applying for funding to delivery of the project said to be excellent. The Adventa staff would come out and meet with Peter and help/advise him with the application process as well as claiming and the monitoring data required. Take a look at how we've helped other businesses in Monmouthshire.